When it comes to homebrew projects, Google is actually a pretty cool company. Unlike some of its rivals in Silicon Valley—particularly in Cupertino—the search giant sometimes likes to help people hack into its hardware and make it their own. The latest example of this fine tradition helped one crafty British man turn a vintage intercom into a working version of a Google Home. The adventure started when Google bundled an AIY (Artificial Intelligence Yourself) Projects Voice Kit with the May issue of MagPi magazine. The kit included a Raspberry Pi HAT (Hardware Attached on Top) that made it possible to add natural voice interaction to any Pi-powered project using the Google Assistant SDK. While the MagPi magazine offered instructions on how to build a little cardboard box that you could talk to, a hardware hacker from the United Kingdom had other designs. MisterM, the hacker in question, has an ultra fun habit of converting vintage electronics into powerful computers using technology like Raspberry Pi. And since Google basically gave him everything he needed for free with the MagPi magazine, MisterM decided to turn an intercom from 1986 into an operational Google Home. The process of the conversion actually sounds pretty simple as there’s no soldering involved. 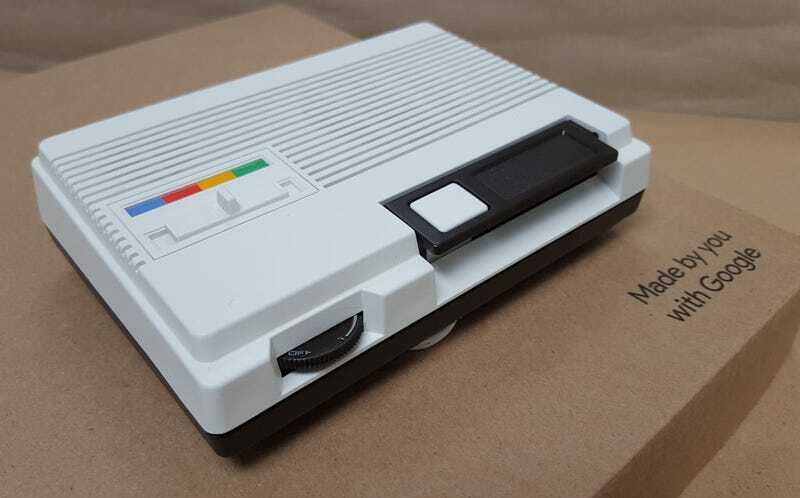 Based on MisterM’s step-by-step breakdown, it actually seems like the toughest challenge was getting the Raspberry Pi and related components to fit into the 80s-era intercom housing. But he did it! In the end, the Google Assistant-powered intercom isn’t quite as powerful as a Google Home. It can accept commands and, with the help of IFTTT recipes, control some of MisterM’s smart home gadgets. But for now, the Google AIY software doesn’t offer Chromecast or music integration, and it won’t work with a wake word like “OK Google.” That could obviously change if and when Google updates the source code. Either way, MisterM’s intercom is not only clever. It’s absolutely awesome—especially because his Instructables post tells you how to build your own. The only problem is getting your hands on that Google AIY kit. Right now, issue 57 of MagPi, the one that included the Google AIY Projects Voice Kit, are selling for up to $100 on eBay. However, MagPi says that Google and Raspberry Pi are now working on a way to sell the kits to the general public, no overpriced magazine required. So be patient, hackers. Help is on the way. And if you thought this project was fun, check out what else MisterM has done with vintage electronics and Raspberry Pi. The 1970s telephone with Amazon Alexa built in is especially cool.